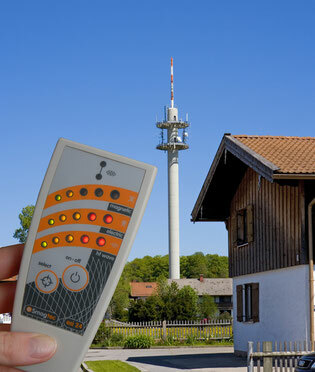 The SBM (German: Standard der Baubiologischen Messtechnik) is a standard developed by a board of German buildings biologists and technical experts on how to measure and evaluate electromagnetic radiation exposure. It also contains guide values for other environmental factors such as indoor air quality. The values given in the standard are recommended levels for long term exposure. Healthy adults can usually tolerate higher levels of radiation, while other groups of the population, like newborns and the sick and elderly seem to be more vulnerable. Since long term effects of 24/7 microwave exposure seem very unclear at this point, and some general health developments like the numbers of cancer cases or degenerative diseases of the nervous system give cause for concern, it seems prudent to adopt exposure values similar to those in the SBM standard as a precautionary measure. Electromagnetic Radiation Exposure Guidelines "SBM"
The Standard of Building Biology Testing Methods SBM 2015 (latest published edition) - BUILDING BIOLOGY EVALUATION GUIDELINES for sleeping areas. Contains exposure guidelines for a number of environmental toxins like EMF, volatile organic compounds (VOC), mold, etc.